Bakery-quality Giant Reese’s Pieces Chocolate Chip Cookies are thick, chewy, chunky, and soft. 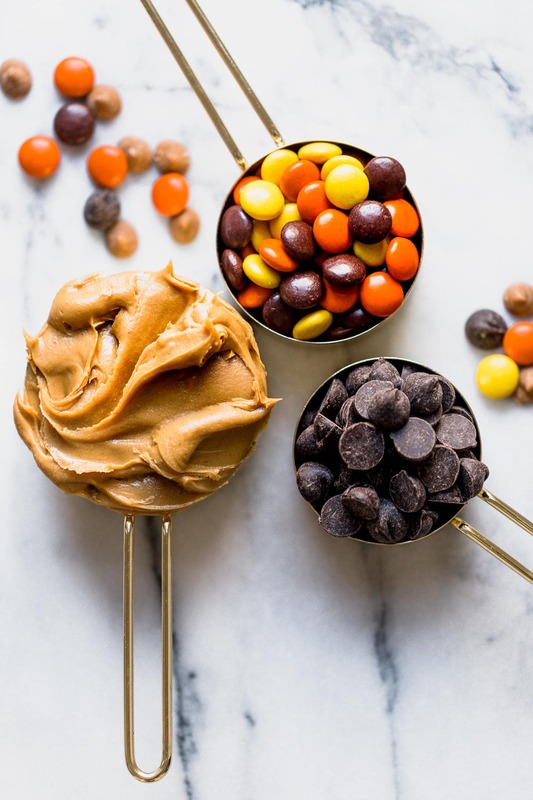 An incredible combination of peanut butter and chocolate! Get my free Cookie Customization Guide here. Taste: If you read my blog regularly you know I am obsessed with the combination of peanut butter and chocolate. For that reason these cookies are like a dream come true for me. Texture: Thick, chewy, chunky, and soft. Ease: Very easy. This dough is stuffed full of goodies so be sure to really pack the dough balls together so they retain their shape. 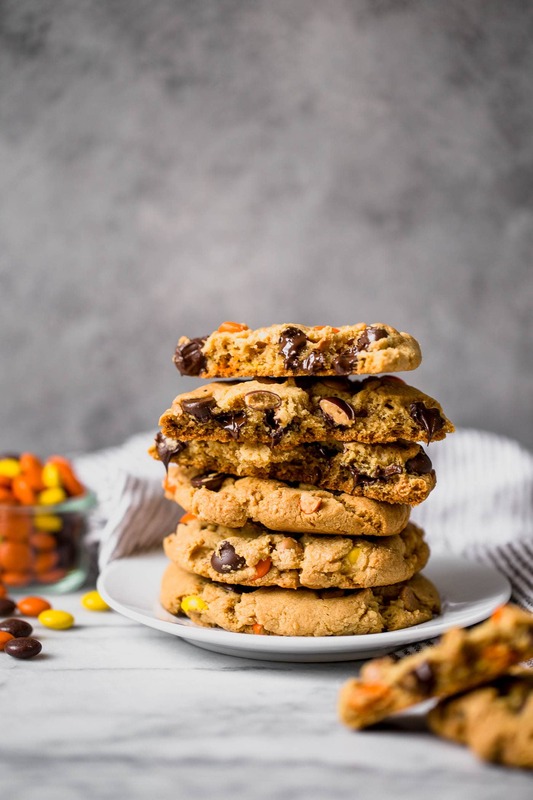 Appearance: I love how these cookies are speckled with little tidbits of bliss (peanut butter chips, chocolate chips, and Reese’s Pieces). 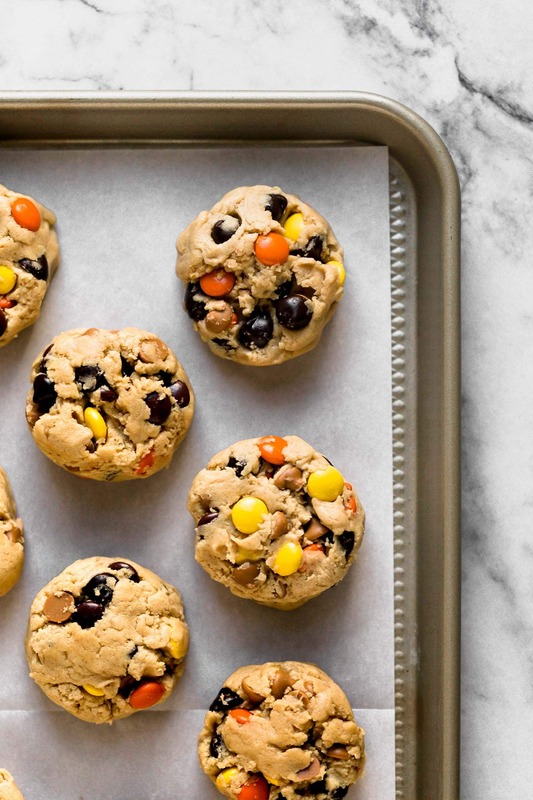 Pros: This recipe may very well become your new favorite cookie recipe! Would I make this again? I saved half of my balls of dough for the freezer for when I’m craving these cookies next time. 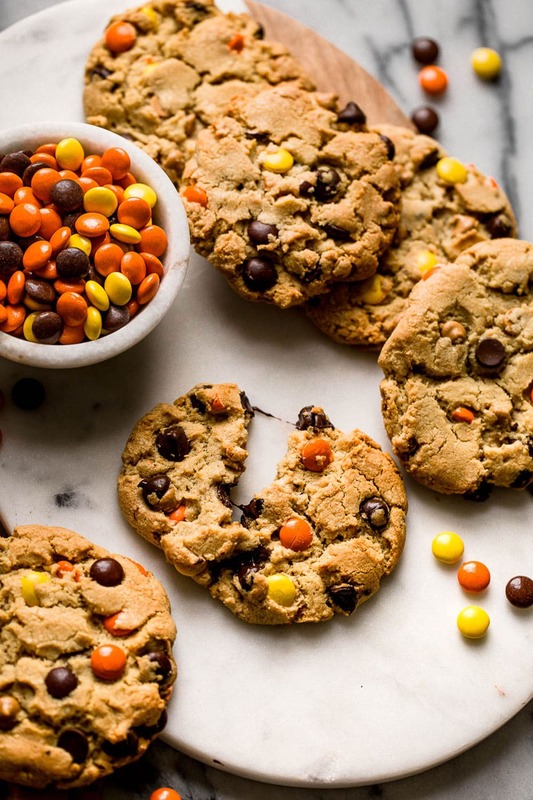 These Giant Reese’s Pieces Chocolate Chip Cookies are everything you could want in a single treat. It truly doesn’t get better than this. Chocolate + peanut butter. That’s a winning combination if there ever was one. An obscene amount of the best mix-ins you could ask for: chocolate chips, peanut butter chips, and Reese’s Pieces. They’re so big they look like they belong behind a bakery case display. They’re slightly crunchy on the outside, soft yet chewy throughout, with oozing bits of chocolate in each bite. To make them so big you roll dough into 1/4-cup size balls, then flatten slightly before baking. The result is a cookie as big as your hand with the perfect amount of thickness. If you’d like to make regular sized cookies, roll the dough into 2-tablespoon sized balls and bake for about 10 to 12 minutes. These Giant Reese’s Pieces Chocolate Chip Cookies actually stay nice and soft days after they’re baked. But sometimes nothing compares to a cookie so fresh it’s still warm from the oven. If you agree, this dough also freezes wonderfully too. 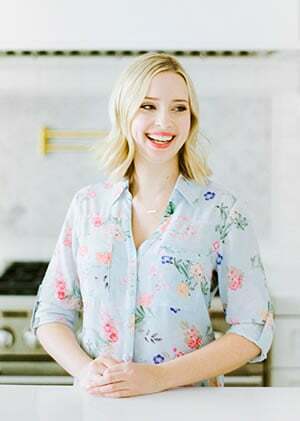 Get my tips on how to freeze cookie dough here. Also, if you’d like more tips on customizing your cookies to make them thick, thin, chewy, crispy, cakey, or soft, then check out my free Cookie Customization Guide here. Preheat the oven to 350°F. Line baking sheets with parchment or silicone baking mats. In a medium bowl combine the flour, baking soda, and salt. In the bowl of an electric mixer, beat the butter, peanut butter, brown sugar, and granulated sugar on medium-high speed until very well combined, about 2 minutes. Add the eggs, milk, and vanilla and beat until combined. On low speed gradually add the flour mixture and beat until just combined. Add the chocolate chips, peanut butter chips, and Reese’s Pieces and beat until combined. You may need to do this by hand with a spatula if your mixer isn’t strong enough. Roll the dough into 1/4-cup balls and place on the prepared baking sheets. Flatten the dough balls into 1/2-inch thick disks. (At this point the dough can be frozen.) Bake for 12 to 15 minutes, or until the cookies are light golden brown at the edges. Place the baking sheets on cooling racks and let cool completely. Store the cookies in an airtight container at room temperature for up to 5 days. *This post was originally published in 2013 and updated with new photos, video, and weight measurements. Photos by Jess Larson. these cookies look SO SO soft! they’re my FAVORITE type of cookie and you adorned them with my favorite candy 🙂 looking awesome, Tessa!! These look so soft and I love reeses pieces! I want to make these today! I don’t know if this is a silly question, but since I cook for only myself, I don’t like making a huge batch of cookies for just me. I know that I can freeze cookies after they are baked. However, I would prefer to freeze a dough and then either slice and bake as I would want a cookie, or in this case use a ball for a freshly baked cookie. Do you think this would be a good recipe for freezing? If not, are there other ones that you could recommend from your recipe collection? Thanks! I definitely froze at least half of the balls of dough from this recipe. Most cookie dough recipes can be frozen just before they’re baked. I like to stick all the balls of dough I want to freeze on a small parchment lined baking sheet inside the freezer and freeze until the dough balls are hard. Then I’ll remove the dough balls to a resealable plastic bag. This way the dough doesn’t become stuck together in the freezer. Defrost at room temperature and bake per the recipe directions – you may need to add a minute or two to the baking time if the dough is still cold. These look to. die. for. I love chocolate & PB together too. I will have to try these next time I’m in the mood for cookies! Now those are some cookies! I love how they’re so big and studded with all of those tasty tidbits. I’m crazy about peanut butter and chocolate, so I know I’ll be wild about these. I think freezing half of the cookie dough balls is a fabulous idea. That would keep me from eating a half dozen a day, I think! These look incredible! I need them in my life!! You had me at thick, chewy, chunky and soft! These look so fabulous! I am reading The Fault in Our Stars right now. I am already so upset by it. I’m hoping for a happy ending but not holding my breath. These cookies are gorgeous! The texture looks perfect. I can’t wait to make these! I read the comment about freezing the dough balls…I love doing that too! It makes it so easy to have a few freshly baked cookies anytime you want. So happy to have found your site! Oh my goodness these look decadent!! Absolutely must try! The cookies would be perfect for when you’re reading a book. :)) Please do try reading Hopeless by Colleen Hoover. It’s surprisingly good. Made these last night! ABSOLUTELY FABULOUS!!! I was worried that they were going to be too peanut-buttery and too rich, but it really is a perfect mix! They are so pretty to look at too! I’ll be making these again for a baby shower next weekend! Thanks for the recipe! Just made these tonight. We all loved them here in my household! The perfect texture, perfect indulgence of chocolate, peanut butter and candies. Thanks for such a great recipe! Hi would love to try these cookies but we have a nut allergy in our house. Could I just leave out the peanut butter or do I need to replace it with something? I don’t ever write reviews for anything, but I just made these cookies and they are killer!!! They might be the best thing I have ever made, and I cook for a living. Seriously good, no joke. Wow, what a wonderful compliment! Thanks so much Sarah!! Hey!!!! I just made these cookies and they are DE-LISH! Only thing I would change would be the amount of chocolate chips/reeeses. I would put HALF cup. I didnt have enough dough for a cup. Thanks! I JUST made these (literally… the 3rd batch is still in the oven!). They are easy to make and delicious. I made the recipe as written, including using 1 cup of each type of chip, and I didn’t find it too much, although I had to do a lot of mixing to get them all incorporated. Would probably have been easier if I added them 1 at a time and mixed in between. I used my retractable cookie (ice cream) scoop to scoop out the dough, and the back of my 1-cup measuring cup to flatten the cookies. I was tempted to leave the cookies in longer than when the edges turned golden, but I am glad I pulled them out as I think they would definitely have been overcooked. Mine are still warm, so not sure if they are a cookie that stays soft or not, but out of the oven they are AWESOME!! Highly recommend this recipe!! can we use natural peanut butter? These are amazing! I’ve made them several times. They are just like those awesome, thick cookies you get from a professional bakery!